Discussion in 'Roller Coaster Construction' started by Hyde, Oct 31, 2016. Well going by the artwork and what has been built so far I think its safe to say it will definitely be a journey through the Forbidden Forest were you encounter magical creatures (such as the Cornish Pixies seen in the image) as rumoured. I'm intrigued to see will the trains be like Hagrid's motorbike (as also rumoured), the flying car or something else? And the recently discussed building with the large Gothic window that the coaster goes through looks to be just some sort of ruins in the forest separate from the main Hogwarts castle. I'm not even going to Florida anytime soon but I'm still really excited to see this finished (and hopefully eventually ride it some day). Concept art looks decent, though not much to go by! I'm also curious as to what relevance the pixies from the second film have to the ride. We shall see I guess. DelPiero and Matt N like this. That would work, but it would need a large lake to be immersive, and it's a bit high, and the boathouse wasn't anywhere near as large as the building currently is. Could be Lockhart's room where the pixies were located in the film, but again goes against the fact the main castle, including that classroom is already built. It’s just the ruins of a church type building. You can see it in the artwork. toofpikk and Lofty like this. toofpikk, shawnoc, Zek_Teh_Kek and 5 others like this. Ah I get what that building is. Universal visited Alton Towers and thought towers was trumping them on theming. They wanted a towers just like Alton’s. This coaster tho is looking amazing, I can’t wait to see more theming going up and planting. It’s so rare that we see such a large coaster fully themed. I must admit I too was getting Alton Towers vibes, especially from the concept art. I thought it was more helpful than most of those twitter updates. It shows the track a lot better and it really is close to the train. Howie, sam_coasterz and Matt N like this. The "most expensive attraction" angle is an interesting one, and one I haven't thought about before for this. If it's not the most, it'll certainly be up there I'm sure! Which one currently has the record, again? I believe Spiderman at IoA is the most commonly cited most expensive attraction ($250 million dollars in 1998 - although that might be the total cost for all incarnations of the ride, since other sources I've found say $75 milllion for the Florida version), with Everest being the most expensive coaster ($100 million, 2006), but I think I read somewhere that Flight of Passage might have it beat. Not sure where I saw that, though, or if I just imagined it all. My previous Disney Park fandom comes in handy. Probably Pirates in Shanghai DL. No official amount has been released, but it’s thought to have cost a $300+ million of the $3.7 billion Disney dumped into it. Radiator Springs and Test Track have costs of around $200 million. The former with its scale and the latter because the technology didn’t work. I imagine that means Journey at Disneysea cost at least $300+ million if you include that Volcano. That park cost $3 billion. And the new Star Wars Land cost $1 billion each. Disney’s budgets are disgusting, but I do wonder how accurate those numbers are. I mean that’s a lot of money. I find is really fascinating at how expensive some of these Disney rides cost. I know they're all about quality and want to maintain their immersion, but you look at all these European parks like Phantasialand and Europa Park, and can see some equally impressive theming in certain areas. Surely they can't have a budget to the likes of Disney? I don't know if it's a comment on the 'cheapness' of these other parks, or if it's that of Disney not being able to optimize their expenses. Just something interesting I thought about and wanted to share. The theming Phantasialand and Europa do might be on a similar quality, but definitely not of a similar quantity and scale. Take a look at Pandora for example. The land is intricately themed and has tons of detail similar to Klugheim in Phantasialand, but it is also massive, housing 2 rides, one of which is very technologically advanced. On top of that they added massive "floating" islands to it. The sheer scale of Disney's projects can rack up costs quite high since they are going for both quality and quantity. vaugc002, EpochEmu, GuyWithAStick and 1 other person like this. I did a quick area comparison of this site vs Klugheim, and you can see quite quickly the size of this area absolutely dominates. Yes, Klugehim has two coasters wrapped up in between all the paths and shops and things, but I reckon that cost increase is only marginal when compared to doing an area nearly double the size. vaugc002, EpochEmu and Stevie like this. And also from what I read here, Phantasialand's zones aren't that cheap either. I think I read on this forum that Klugheim was nearly 100M euros, but maybe my memory is wrong on this one. Does anyone know ? The initial investment for Deep in Africa was 22 Million Euros. Half of it was for theming and the other half for Black Mamba. There is no information on the cost of the retheming (e.g. new rocks) that took place this year. Unfortunately I don't find any numbers for Klugheim. But I'd assume it'd be closer to 50M than to 100M. No official figures were ever given for Klugheim other than the fact 70% of the budget went towards theming. 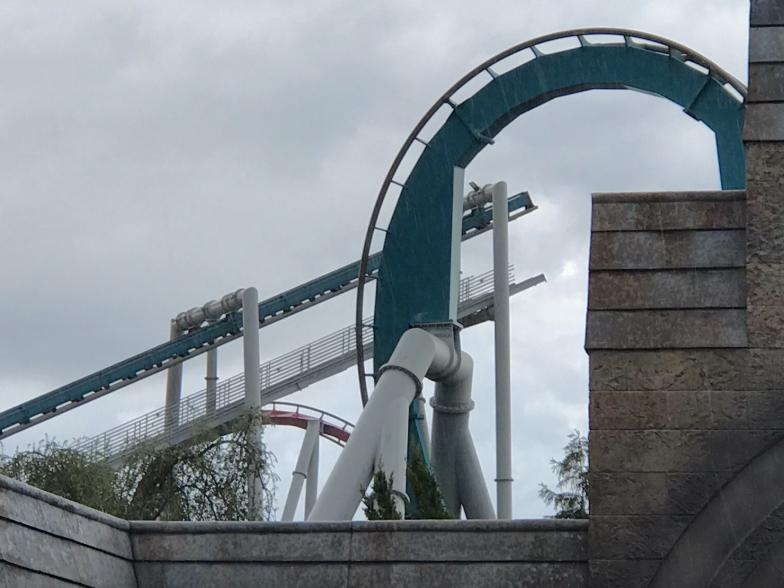 But based off the typical cost of those two types of coasters together it can be predicted to have been around 70 million euros. Is it just me, or does €70million seem a slightly perturbing amount for a park as small as Phantasia to be spending? Not that Klugheim doesn't look stunning, but I'm surprised that Phantasialand are in a position where they can spend that much money.